It may be too late to get that reservation for Bistro de Paris or Le Cellier for Valentine’s Day, however, in keeping with the spirit of the day the Gazette Roundtable assembled some of their most romantic ideas. From fireworks and France to twilight walks and sandy beaches, here are just a few ways to maximize your starry-eyed evenings. Roundtable Topic: When you think of the word romance, in relation to Walt Disney World, what comes to mind? Roundtable Guests: Eric Hoffman (Netmongrel), Lori Burke (We Wants the Redhead), Chris Fore (Yet Another Disney Blog), Matthew Sedlar (The geekTicket and Hitchhiking Ghosts), and myself. Eric – Walt Disney World holds a special place in my heart first and foremost because it was the location of our honeymoon. That trip marked the beginning of a mutual passion for and love of Walt Disney World that my wife and I share. Now we vacation with there with our 3 girls and they naturally share that same passion and love with us. When it comes to spots in WDW that help set that romantic mood I immediately think of two locations. 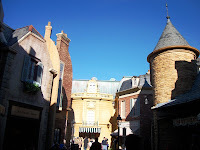 The first is the France Pavilion in Epcot’s World Showcase. Right as dusk falls the crowds seem to be a little more hushed as you approach the pavilion from across the International Gateway. The lights are coming on outside Les Chefs de France and the sound of the fountains invite you to stroll down into the beautiful pavilion to enjoy a quiet, out of the way spot to sit with a loved one and enjoy a beverage and treat together. The other spot I find romantic is the front entrance of Cinderella’s castle at night, preferably after closing when the bulk of the crowd has left. The view down Main Street USA and the ambient lighting from the castle itself create an otherworldly atmosphere. It is just the right spot to steal a little kiss from my beloved princess! Matthew – As someone who spent a portion of his honeymoon at Walt Disney World, I've thought about this a lot. A nice stroll along the BoardWalk or a boat ride from Epcot to Hollywood Studios or vice versa (sitting outside) can be romantic. World Showcase also has some great spots and restaurants. A quick shout out to the West Coast: A water-side table at Blue Bayou can be really romantic, as long as you can put up with the occasional tourist on POTC shouting, "Are those people real?" Chris – So many things come to mind. World Showcase at night (especially France and its environs). A twilight trip on the Sassagoula River from New Orleans to Downtown Disney. An evening at the Grand Floridian, taking in the soft jazz and piano music in the lobby, an intimate dinner (at V&A if budget and circumstances permit), and a quiet spot to take in the Magic Kingdom fireworks. The Wedding Pavilion. But most of all, for me romance at Walt Disney World is a state of mind. It's a willingness to slow down, take in your surroundings, and make some of your own magic. 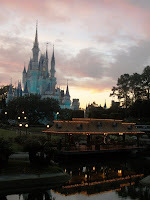 Lori – When I think of romance at Walt Disney World I don't think of an attraction, a stage show, a resturant or even a boat ride. I think about Wishes! For me, the most romantic thing to do is to stand in front of Cinderella Castle, just off to either side of the Partners statue and watch Wishes! There is something about standing there, in the arms of the one I love, enjoying the fireworks and listening to the music. The crowd seems to disappear and it's just us. Ryan – Romance can be found just about anywhere you look in Walt Disney World, on one occasion I even turned Splash Mountain into a heart-swelling cruise (but that’s a story for a different day). A lot of finding the romantic nooks around the parks and resorts has to do with your own personal attitude and the outlook of the loved one you are with. Strolling along World Showcase Promenade, hand-in-hand down the BoardWalk, or even snuggling in close as the monorail creeps around the Seven Seas Lagoon are all small and significant ways to set a romantic mood. However, for an experience that will truly set your heart flying, I recommend Characters in Flight, particularly during the hours of twilight and nighttime. While sunsets may be the hallmark of an evening of adoration, taking to the skies when the sparkling stars above match the twinkling lights below sparkle for sparkle, not to mention the ability to hold onto one another to admire the view, is enough to make even the stodgiest of hearts skip a beat. Looking for more romance in Walt Disey World? Be sure to check out this week's episode of All About the Mouse, where Tony, along with Bryan Ripper and Matt Hochberg, discuss where Walt Disney World and love intersect. Thanks for such great post. I am delighted to know that people are aware about real estate.